Compiled by Cochrane collaborators and members of OMERACT (Outcome Measures in Rheumatology), Evidence-based Rheumatology is an essential resource for evidence-based medicine as applied to the musculoskeletal disorders. 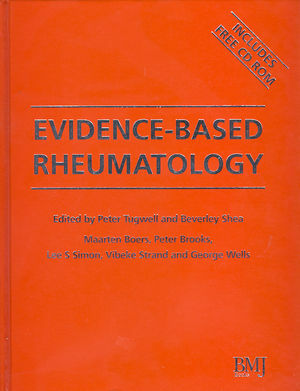 The introductory section covers the principles of evidence-based medicine in rheumatology, followed by clinical chapters covering all the major disorders. Each chapter includes non-drug therapy, drug therapy, and consumer evidence-based summaries. Dr. Peter Tugwell is Professor of Medicine and Epidemiology & Community Medicine at the University of Ottawa and is a practicing rheumatologist at the Ottawa Hospital. In 2001, he became Director for the Centre for Global Health at the Institute of Population Health. Knowledge translation for patients: methods to support patients' participation in decision making&. "As a clinical rheumatologist, I found this resource valuable, with the main clinical questions clearly expressed and easily accessed with the colored bookmarks and, especially, the useful CD accompanying the printed edition. The book can serve as a companion in daily practice, either in an outpatient or ward environment. The PDA capabilities and the easy search engine for use in a laptop make it portable and reliable, and an update capacity via the internet is of extra value." Download a sample chapter FREE online!